Weight gainers and muscle gainers are two names for products that offer the same thing -- extra calories from a mix of carbs, protein and fat to help you gain weight. These products are generally marketed to bodybuilders looking to add more muscle to their frame. Don't confuse them with protein powders, which generally only provide protein. Consult your doctor before adding any nutritional supplement to your diet. Weight gainers and muscle gainers are types of nutritional supplements typically found at your local health food stores. In addition to calories and macronutrients, these products may also contain a variety of vitamins, minerals, amino acids and various other ingredients touted as aiding in your efforts to promote muscle growth. According to Human Kinetics, these products may help you gain muscle mass when combined with a strength-training program. These high-calorie supplements may also help you gain fat weight, however, if they contribute more calories than your body burns. While the goals of these products are the same, they all vary in their nutritional makeup, especially calories. Depending on your product of choice, the calories per serving can range from 660 to 1,340. Most of these products are low in fat, with 2.5 to 3 grams per serving, and contain about 50 grams of protein. In addition to calories, the amount of carbs also varies, ranging from 104 to 277 grams per serving. Some weight-gain powders also contain most of the essential vitamins and minerals in high amounts, while others contain very few of these nutrients. When your aim is to build more muscle, you may be concerned about the amount of protein in your diet and may consider protein powder as a dietary supplement. 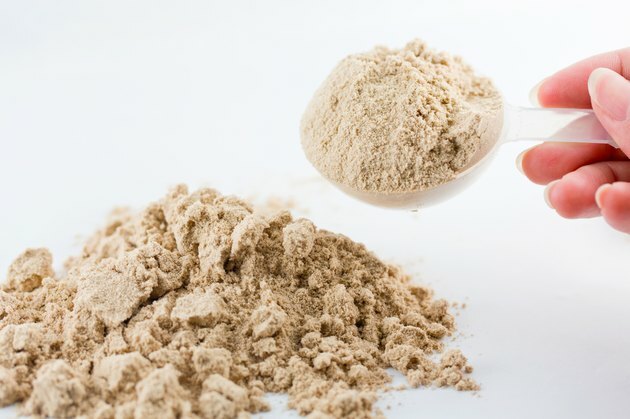 Unlike weight and muscle gainers, protein powders contain only a significant amount of protein, isolated from various sources including whey, casein, egg or soy. These supplements are not necessarily meant to promote weight gain but rather increase protein intake. But if they add extra calories to your diet beyond what you need, they'll help you gain weight. Nutritionally, they provide fewer calories and protein than weight and muscle gainer supplements, with about 110 calories and 24 grams of protein per serving. Most people get enough protein from food, however, so protein powders aren't necessary in most cases. While weight gainers and muscle gainers are a convenient source of calories for those trying to gain weight, the McKinley Health Center says that these types of supplements are not necessary. You may have more control over nutrient intake by getting the extra calories you need from real food. Make your own weight-gain shake by blending together bananas, strawberries, Greek yogurt, peanut butter and ice or soy milk, along with tofu, blueberries, mango and flaxseed. Other high-calorie foods to help you gain weight include eggs, nuts, cheese, whole grains and beans.